To a hammer, all problems look like a nail. And Maslow's Hammer is pretty much the tragedy of John Wick: Chapter 2, at least I believe that the film would have it so. Film has adult themes, discussed below the poster. The film, enjoyable as it is, is essentially the same as its predecessor, only bigger, flashier and more preposterous. Once again, retired hitman John Wick's unresolved grief issues are poked in a raw place; one more time his considered response is to kill everyone responsible for his pain. I have the strongest feeling that Chapter 2 wants to present this as tragedy, in the classical sense of a great figure being undone by what what makes them 'great'. In this case, the tragedy of a man trained to kill people in a wide variety of ways whose response to personal crisis is to.... well, you get the picture. Consider that the film goes out of its way to present John Wick as a legend. Leading lights of the criminal underworld and its international league of assassins swap stories of his exploits, indulge him, sometimes even defer to him. He's not just a gangster - he's the grieving Fisher King of hitmen, mourning the death of his wife (and the pup from film one) and now the destruction of his house to boot. And consider too, that a perfectly cast Keanu Reeves owns this 'still waters run deep' schtick like no-one else in the business. The film is asking you to root for him, just a little, even if only by comparison to everyone else in the film. The problem with setting him up as a tragic figure in the narrative is that the material can't sustain it. For JW to be some sort of fallen samurai or antihero, there would have to be some element of ethical struggle accompanying his actions. 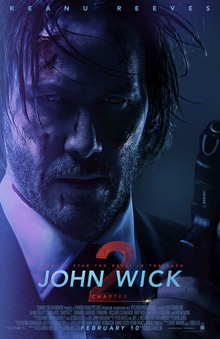 But, to put it in the language of Dungeons and Dragons alignments, what we have in John Wick: Chapter 2 is a Chaotic Neutral, verging on Chaotic Evil, character taking down a Lawful Evil criminal empire, purely for personal revenge. Even when he's presented with alternative solutions that don't involve killing, he doesn't hesitate to take the direct route. And there's nothing great or tragic about that because there's no inner conflict. At best, it's just pop nihilism. Chapter 2 is a beautifully shot and choreographed action B-movie, but it overreaches when it tries to portray its protagonist as more than what he is. And that's all I really have to say about it.